Mansion Krongthong Balance of the space in the peaceful privacy of home. Luxurious like a hotel with two superb second project, located near the main road near the train station. Near the mall Ideal for urban residents in sub-V. Convenience for business travel. The modern design Luxury room Fully furnished Floor Air Conditioner Water heater Cable TV services High-speed Internet in all rooms, and privacy. Shops and services Infrastructure Parking space Advanced security Key card access - the parking lot. Key card access - the buildings. CCTV on every floor, 24 hour Krongthong Mansion. Managed by a team of professionals. Ensuring the quality of living is always attentive. We provide a warm and friendly atmosphere. 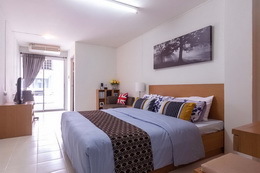 Krongthong Mansion Ladprao 81 to the atmosphere is calm, comfortable, modern accommodation. Interior and furniture Install the air con. Cool relaxation Installing a water heater Installed high-speed Internet (Hi Speed ​​Internet) all equipped with UBC channels you receive. Entertainment, documentaries, music, sports, and the more modern bath. Every building has an elevator, shops and Sathorn various utilities. Supports the use of the ground floor facilities. Installation of CCTV cameras on every floor (CCTV) systems KEY CARD in the - out. For privacy 24-hour security staff near the mouth of Soi Ladprao 81, cut out to the street along the highway. Ram Indra - At Narong easy, near Big C Ladprao, Tesco Lotus, Home Pro, Mall and The Mall Bangkapi. Luxurious interior with modern furniture. Facilities and equipment Installation of air conditioning in every room. Installing a water heater Systems, high-speed Internet (Hi-Speed ​​Internet) equipped with Cable TV (Cable TV) and the receiver stars Pentium. You get the news, documentaries, entertainment and sports in any format you like. Modern bathroom design The building has elevator - up 2 the shops. Support services in the downstairs rooms. Installation of CCTV cameras on every floor (CCTV) system, fingerprint (Finger Scan) in and out for added privacy. Security guard and care staff available 24 hours a spacious parking lot. Safe with Key Card Access to the parking lot. 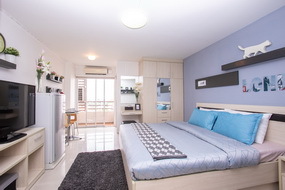 Krongthong Mansion Sukhumvit 77 is located on a convenient location. Near the BTS Sukhumvit Road, Outer Ring Road and shopping malls.